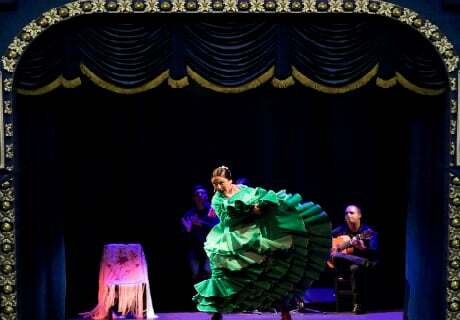 Teatro Flamenco Triana is a venue in Seville dedicated exclusively to flamenco song, dance and guitar. The venue is a unique theatre along the banks of the Guadalquivir River in the heart of the Triana district, the historical cradle of flamenco. The theatre is a unique space for flamenco performances. With a design inspired by the Seville of the Ibero-American Exposition of 1929 and state-of-the-art technical equipment, Teatro Flamenco Triana offers a continuous program of shows with prestigious figures of current flamenco. The theatrical programming is both a vindication of the mastery of consecrated artists of different generations, as well as the gateway to the stage for new talents that emerge in the flamenco school of the Cristina Heeren Foundation of Flamenco Art, creator of this scenic space. The flamenco school, with more than twenty years of history, is considered the best flamenco schools in the world in its specialty according to Lonely Planet. 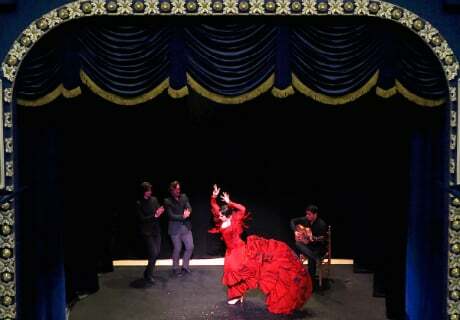 It has also been recognized by the Ministry of Culture, the Junta de Andalucía and the Chair of Flamencology of Jerez. *Children/Students/Seniors: For prices please select a date/time above and click "Next". Children under the age of 4 are not allowed to enter.